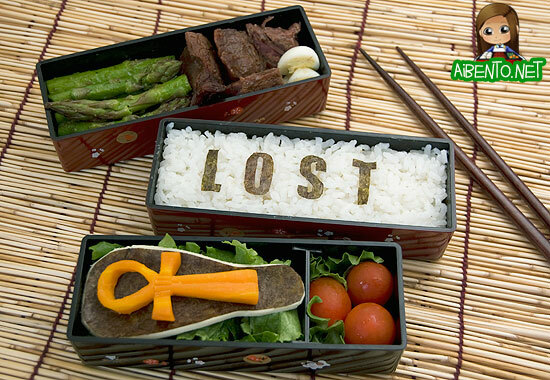 Home » LOST Bentos » I carried this bento across the ocean and like, through time. 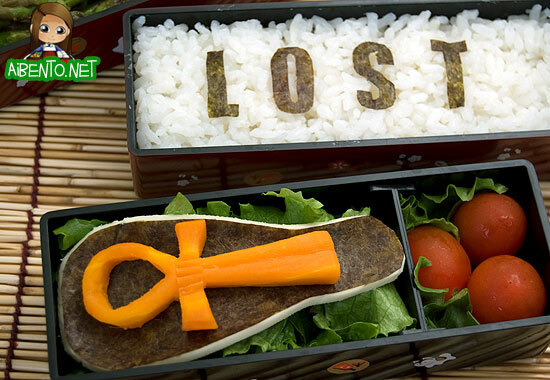 A couple of weeks ago my latest purchase from J-List came in and I’ve been waiting for the right bento to use it on and oddly enough, the time came today when I had to do my LOST bento. It was easy enough to come up with the idea for this one, but it ended up being harder to do than I thought, so I did kind of a simpler thing. Since I don’t want to splatter major spoilers on my front page, I’ve got a photo of this gorgeous box and those who want to see it can read under the cut. Fans that watched last week probably know what it is by the post title. 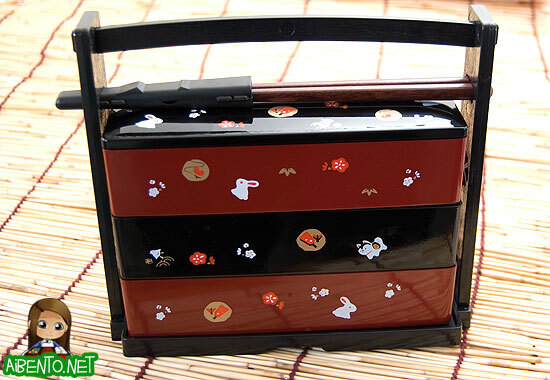 This is a three tier bento box by Hakoya and comes with a strap and matching chopsticks. It’s got a beautiful carrier and the chopsticks keep the box from falling over in the carrier. Last week, a new character on the island was introduced that chose to speak only Japanese. People probably remember him the most from The Last Samurai. I know I did. 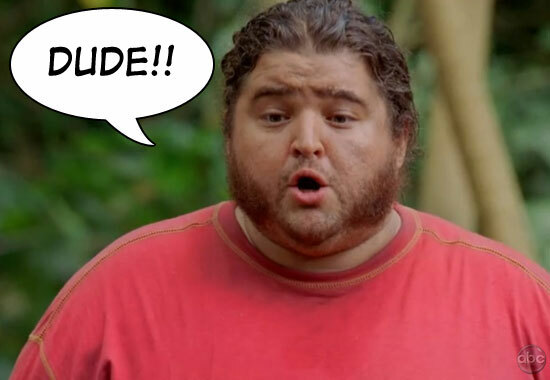 In any case, this guy’s been on the island for who knows how long. You know this guy has been just DYING for a bento right? No matter how many times they raid Dharma food, I doubt there was ever one in there for him to lay claim on. So, this one is dedicated to the other Others Leader, whose name I don’t know. As you can see, this is the ankh that was inside of Hurley’s guitar case. I’d wanted to do the whole case top and bottom, but the sides were too hard, so I just laid it on top of the case. In the back box, I have garlic asparagus and some steak from Grandma J yesterday, along with a boiled quail egg. I carved it out of carrot with my paring knife and it was actually pretty easy. 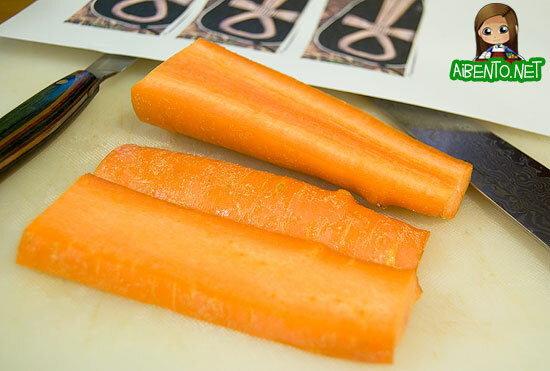 I printed out three ankhs in case I messed up and then cut one out and laid it on top of a thick strip of carrot. I used another of the print outs to cut out the guitar case from nori, then laid it on two joined slices of cheese and cut it out with a toothpick. Here’s a closer look at it. 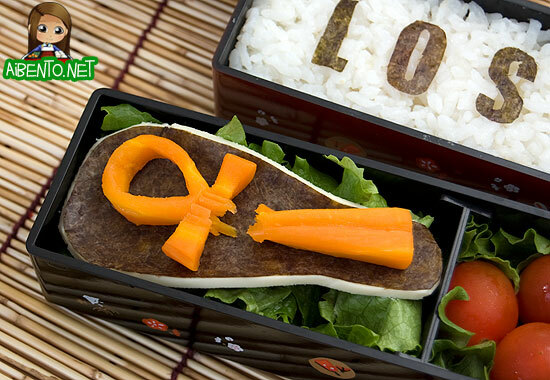 Luckily, I’d saved the cut out letters from my Lost spam musubis, so all I had to do was cut out an ‘O’ and that was done. The cheese guitar sits on top of torn lettuce, which I’ll eat as a mini salad with dressing I keep in the fridge at work. Now that you’ve seen it, you know what we have to do, right? I was going to add a little soy paper note folded up, but I didn’t have time. Just pretend it’s there. It’s got the names of all us bento bloggers on it.